Curried Chicken Pot Pie, leftovers make a great pot pie. Roasted or other cooked chicken breast is used for this quick and easy Curried Chicken Pot Pie. 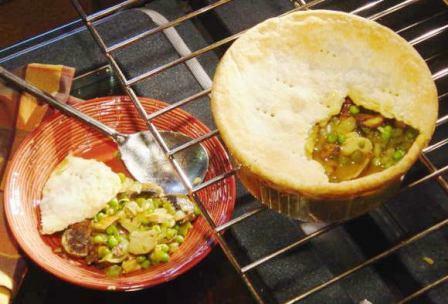 Pot pies are warm and inviting. Curry powder added to the sauce gives this pie an intriguing flavor. Using prepared ingredients from the supermarket, you can put this pie together in minutes. It’s a one-pot meal that only takes 30 minutes to make. A ready-to-bake pie crust makes this dish a breeze. This recipe for 2 calls for a 6-inch deep dish or soufflé dish. Most crusts are 8 or 9 inches. Simply lay the crust over the 6-inch dish and cut away the extra dough. To shorten the cooking time, sprinkle seasoned breadcrumbs over the ingredients instead of a pie crust and bake 10 minutes. If you like, open a washed, ready-to-eat bag of salad to go with it. This meal contains 635 calories per serving with 32 percent of calories from fat. Preheat oven to 400 degrees. Heat the oil in a large nonstick skillet over medium-high heat. Add the curry powder, onion, green pepper and mushrooms. Saute 5 minutes. Add the flour to the vegetable mixture, stir to blend and add the chicken broth. Simmer to thicken about 1 minute. Mix the peas into the sauce. Add salt and pepper to taste. Cut the chicken into bite-size pieces and place in a deep oven-proof pie dish or a souffle dish about 6 inches in diameter. Pour the sauce over the chicken and mix well. Place the pie crust over the top and prick it with a fork in several places. Bake for 20 minutes. Serve immediately. Makes 2 servings. To buy: 1 package frozen diced onion, 1 package frozen diced green peppers, 1 package frozen peas, 1/4 pound sliced baby bello mushrooms, 1 jar mild curry powder, 3/4 pound cooked chicken breast and 1 package ready-to-bake pie dough. Staples: Canola oil; flour; fat-free, low-sodium chicken broth; salt and black peppercorns. Any type of sliced mushrooms can be used. 11/06/14 - Syndicated food columnist Linda Gassenheimer, Special wine correspondent Fred Tasker and WLRN hosts Joseph Cooper and Bonnie Berman interview Jen Karetnick about her latest book is "Mango." It’s filled with recipes from local chefs. She tells how she became known as 'Mango Mama' while cultivating her mango orchard of 11 mango trees with charming stories about learning to grow and use mangos. Plus, a history of the Mango gang and many recipes, including ones that are not always associated with mangos. Fred Tasker gives wines suggestions. Tune in Thursday at 1:30 on Topical Currents on 91.3 WLRN. 10/24/14 - Syndicated food columnist Linda Gassenheimer, Special wine correspondent Fred Tasker and WLRN hosts Joseph Cooper and Bonnie Berman interview Edgardo Texidor, Corporate Trainer for Juan Valdez coffee. We talk Colombian coffee, the different types, how to make a great cup and how to taste coffee. We taste test with him, called a cupping session. This program is a raw unedited version, and includes fundraising efforts. 10/16/14 - Thursday's Topical Currents is with chef, author and syndicated columnist Linda Gassenheimer. It’s all about pairing wines with favorite foods. Linda and wine-expert Fred Tasker speak with Peter Schnebly, who operates the Schnebly Winery in Homestead. It’s the southernmost winery in the U.S. That’s Topical Currents . . . Thursday at 1pm on WLRN. 1 in 3 Americans With Diabetes By 2050? This is a fundraising edition of the program. 10/09/14 - Thursday's Topical Currents: Syndicated food columnist Linda Gassenheimer, Special wine correspondent Fred Tasker and WLRN hosts Joseph Cooper and Bonnie Berman interview Stephanie Dunbar, Director of Nutrition and Medical Affairs at the American Diabetes Association. There are over 100 million US adults and children with either diabetes or pre-diabetes. If we continue on this path there will be 1 in 3 Americans with diabetes by 2050. Simply Smoothies: Fresh and Fast Diabetes-friendly snacks and complete meals and No-Fuss Diabetes Desserts, both published by the American Diabetes Association. 10/02/14 - Syndicated food columnist Linda Gassenheimer, Special wine correspondent Fred Tasker and WLRN hosts Joseph Cooper and Bonnie Berman interview Ritz Carlton Coconut Grove Chef, Ramesh Kaduru and Crown Wine and Spirits wine buyer, Veronica Litton. It's Oktoberfest! Chef Ramish talks about the Ritz October Biergarten and his appearance at the Deering Estate Foundation’s 13th annual Wine On Harvest Moon event. The event features German wine and food. Veronica talks with Fred about German Riesling wines and German beer. Is The Era Of Truly Fine Dining Over? 09/18/14 - 1:30 - Syndicated food columnist Linda Gassenheimer, Special wine correspondent Fred Tasker and WLRN hosts Joseph Cooper and Bonnie Berman interview with John Mariani, restaurant and travel columnist for Esquire Magazine and the Huffington Post. 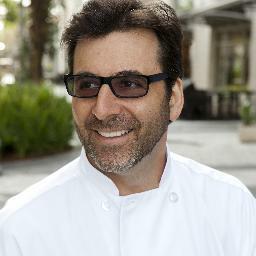 He has been called “the most influential food-wine critic in the popular press” by the Philadelphia Inquirer. We discuss the state of the restaurant industry in the US. He wrote a scathing article “What is Bon Appetit Magazine trying to sell us?” referring to their 50 nominees for the best restaurants of 2014. He questions their assumption that fine dining is dead. We talk about their concept of hipster restaurants; the overpriced food and what America wants when dining out.